Taking the performance, specification and finish to a higher level the Street Triple R delivers the perfect blend of power and performance for focused road riding. With an even more powerful engine the new ‘R’ delivers a host of additional features including four riding modes, new angle-adjustable full-color TFT instruments with 5’’ screen, fully adjustable Showa suspension and Brembo M4.32 radial monobloc front brake calipers. LIGHTER, MORE AGILE AND BETTER HANDLING: Leaner and meaner than ever, these latest Street Triple models are lighter than the previous generation, holding their position as the lightest bikes in class. That weight reduction, combined with the new higher power 765cc engine, has created an amazing power to weight ratio that’s key to the game-changing performance of the Street Triple. This is a truly explosive, agile and exciting ride. The new gullwing rear swingarm, specifically designed for the new range, delivers increased longitudinal torsional stiffness, combined with an engineered reduction in lateral stiffness. This maximises stability at the highest speeds achieved by the Street Triples and delivers tighter corner exit capability and a more precise chassis behaviour, which can be felt on both road and track. HIGH SPECIFICATION SUSPENSION: This Street Triple range is fitted with a higher specification suspension all round, developed and tuned specifically for the latest models. The range-topping Street Triple RS benefits from the highest-specification Showa big piston ø41mm front forks (adjustable for preload, rebound and compression damping), while the rear suspension unit is a premium Öhlins STX40 piggyback reservoir monoshock. The mid-range Street Triple R has ø41mm upside-down fully adjustable Showa separate function big piston front forks with 115mm travel for improved riding comfort without compromise and a Showa piggyback reservoir monoshock rear suspension unit. And the Street Triple S comes with Showa upside-down ø41mm separate function front forks with 110mm travel and a stepped preload-adjustable piggyback reservoir monoshock rear suspension unit. INCREDIBLE STOPPING POWER: This Street Triple line-up all have a higher specification brake set-up than the previous generation. The Street Triple RS has range-topping Brembo M50 4-piston radial monobloc calipers on the front, with ratio and span adjustable lever and a Brembo single piston sliding caliper on the back. The Street Triple R has Brembo M4.32 4-piston radial monobloc calipers and a Brembo single piston sliding caliper on the back for greatly improved stopping power over the previous generation. And the Street Triple S is fitted with Nissin 2-piston sliding calipers on the front and a Brembo single piston sliding caliper on the back. HIGHER SPECIFICATION TYRES: High specification performance tires have been fitted to all Street Triples to complement their higher performance and sporting prowess. 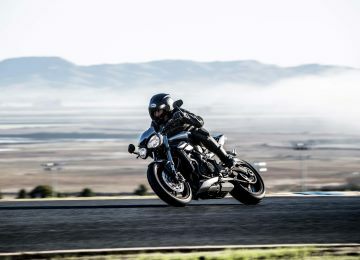 The Street Triple RS comes with range-topping Pirelli Diablo Supercorsa SP tires that provide advanced sporting performance for road and the occasional track use. While the Street Triple S and R models are fitted with premium Pirelli Diablo Rosso Corsa tires, for sharp and precise handling as well as excellent stability and grip on the road. MORE POWER, TORQUE & A RICHER TRIPLE SOUNDTRACK: Based on the celebrated Daytona 675 powerplant, the new 765cc has been designed to deliver a major improvement in performance, particularly in low-down and mid-range torque. Add to that a new ECU and tune, freer flowing exhaust, and a dedicated power set-up tailored for each of the three new models and you get the most thrilling Street Triple engine ever. A STREET TRIPLE TAILOR-MADE TO YOU AND YOUR RIDING STYLE: With three Street Triples to choose from, each with a unique level of power, performance and suspension set-up, there is a tailor-made option for each rider and riding style. From the Street Triple S (built for focused road riding) up to the Street Triple RS (the ultimate performance street motorcycle), each one delivers all of the character and easy rideability the Street Triple is loved for. MORE ATTITUDE, SHARPER STYLING, AND A MORE ATHLETIC POISE: The Street Triple range takes the distinctive and dynamic styling of the original to a whole new level, incorporating more nose down focused attitude, with enhanced contemporary and aggressive lines, new bodywork, a sportier twin-seat design and the highest level of finish throughout. There’s more contemporary bodywork with stunning detailing, including new radiator cowls, improved mudguards and rear body panels. There is a new body-color matched fly screen with integrated air intake, which on the Street Triple S has a more road-focused profile and greater aero protection, and on the Street Triple R and RS has a more aggressive, sharper and sportier profile. The RS has an even higher level of finish with color-coded belly pan, color-coded pillion seat cowl with interchangeable pillion seat, and chain guard as standard. SPORTIER TWIN SEAT DESIGN AND HIGHER QUALITY DETAILS & FEATURES: The new Street Triples all feature an all-new sharper, sportier twin seat design that has been inspired by the Daytona R and Speed Triple – with no comfort compromise. The Street Triple R and RS have enhanced seat stitching detailing and embossed Triumph logo. On top of this, the range is packed with higher quality details, including rider heel guards and forged pillion footrest hangers. 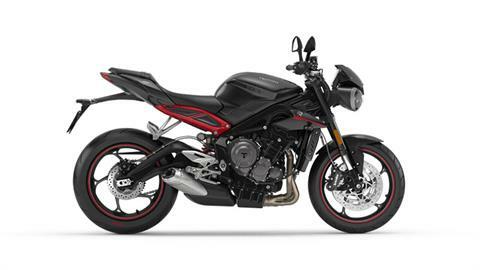 The Street Triple S has a black powder-coated main frame, sub-frame and swingarm. The Street Triple R features Triumph’s signature red rear sub-frame and wheel pinstripes, and the RS has an all-new matt aluminum silver painted rear sub-frame. RIDE-BY-WIRE: The ride-by-wire throttle on each Street Triple model delivers a crisper, more precise, and more accurate throttle response, with improved on/off throttle transition. It also enables different throttle maps which, combined with the ABS and traction control settings, give up to 5 selectable riding models. QUICKSHIFTER: The new Street Triple RS model is fitted with a quickshifter, allowing for clutchless upshifts of up to 2.5x quicker than a skilled rider using a standard clutch upshift. The quickshifter feature is also available as an accessory option on both the Street Triple S and R models. RIDING MODES: Linked to the ride-by-wire system, the Street Triple models have much greater rider control with the introduction of riding modes. You can adjust throttle response, ABS and traction control settings at the touch of a button. The Street Triple S includes 2 modes; ‘Road’ and ‘Rain’. The Street Triple R features 4 modes in total with the addition of ‘Sport’ and a ‘Rider Programmable’ mode. The Street Triple RS delivers the highest level of specification with 5 riding modes to choose from, with the addition of a ‘Track’ mode. ON-BOARD COMPUTER: The high-spec on-board computer on the Street Triple S and R gives the rider access to all key information via the TFT screen. On permanent display is the speedometer, rev counter, riding mode symbol, gear position display, fuel gauge, clock and ambient temperature. Additional rider information is also presented in the selectable ‘tray’ at the bottom of the screen, including two trip displays, average and instantaneous fuel consumption, range to empty, riding mode selection, contrast settings, service information, coolant temperature, warning symbol information and exclusively for the RS model, a lap timer. SWITCHCUBES WITH 5-WAY JOYSTICK: To navigate the new instruments on the Street Triple R and RS there are switchcubes with an intuitive 5-way joystick control that have been ergonomically optimised to be easy to use – either on the move or at a standstill. ABS: The anti-lock braking system from Continental brings a new level of control on all models. ABS is also switchable on the Street Triple R and RS through the ‘Rider Programmable’ riding mode, which can be adjusted to suit Road and Track modes, or turned off completely if desired. DRL HEADLIGHT: The Street Triple line-up all feature headlights designed for a more aggressive stance. The Street Triple R and RS feature distinctive LED Daytime Running Lights (DRL*) built into the headlights. These bring a new eye-catching light profile that makes the bike easier to see out on the road and offers lower energy consumption for greater long term durability. The DRLs are an amazing 28x brighter than the previous generation bulb sidelight.The Street Triple S features new LED position light headlights. The LED position light is 4.6x brighter than the previous generation bulb sidelight. *Please note that the DRL function is not available in all markets – please check with your local dealer. SWITCHABLE ABS AND TRACTION CONTROL: Switchable ABS brings a new level of control to the Street Triple R, while traction control manages both power and torque when the traction is compromised, maximising rider safety and control. 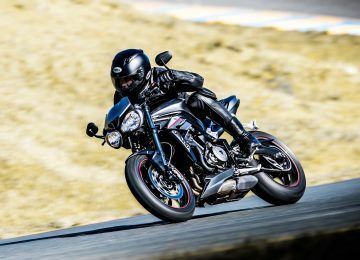 FREER FLOWING EXHAUST: The Street Triple R gets an all-new 765 Triple engine with its own model-specific camshaft that delivers an amazing 11% more power at 116 HP @ 12,000rpm and peak torque at 57 Ft-Lb @ 9,400rpm. R AND RS MODELS: Managed through the ‘Rider Programmable’ riding mode, by selecting the desired traction control setting – ‘Road’, ‘Rain’, ‘Track’, ‘Sport’, or ‘off’. EXHAUST SYSTEM FOR BETTER PERFORMANCE AND SOUND: The Street Triple’s new performance-enhancing exhaust systems help deliver this generation’s significant step up in power. REVISED AIRBOX: These latest Street Triples have a revised airbox, providing much better induction sound on acceleration, for a deeper and richer Triumph Triple roar. The exhaust system delivers better performance and style, minimising its visual effect and reducing the bike’s overall weight. NEW SILENCER FINISHES: There are two new silencer finishes, a beautifully designed S version that perfectly suits its all-round riding focus and more of a sportier styled silencer for the R and RS models, with crafted end caps and heat shield that enhance their performance looks. Front - Cast aluminium alloy 5-spoke 17 x 3.5 in. Rear - Cast aluminium alloy 5-spoke 17 x 5.5 in. Front - Showa 41 mm upside down separate function big piston forks (SF-BPF),115 mm front wheel travel. Adjustable compression damping, rebound damping and adjustable preload. Rear - Showa piggyback reservoir monoshock, 134mm rear wheel travel. Adjustable spring preload (lock-rings), compression damping and rebound damping. Full-colour, 5 in. TFT instrument pack with 3x styles and high / low contrast options.